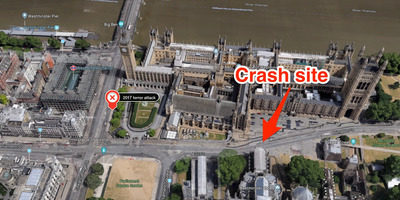 A car hit pedestrians and cyclists before crashing into the barriers outside the Houses of Parliament in London on Tuesday morning. Police are treating it as a terror attack. A male suspect in his 20s was arrested. Three people are injured, but they are not believed to be seriously hurt. 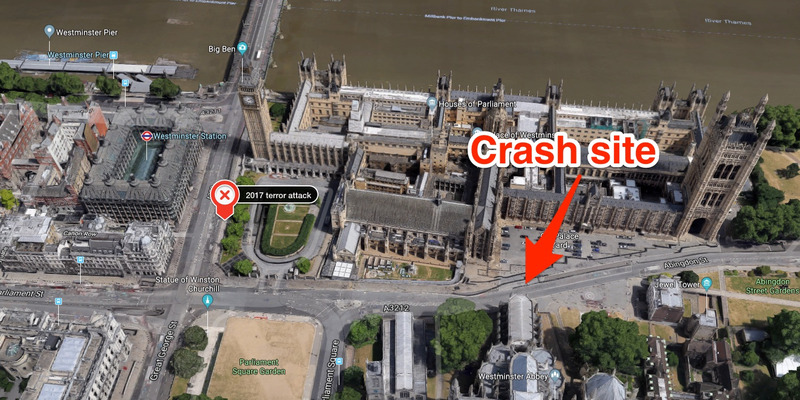 Three people have been injured after a car crashed into the barriers outside the Houses of Parliament in London on Tuesday. The silver Ford Fiesta hit several cyclists and pedestrians before colliding with the barriers at 7:37 a.m. local time. Police arrested a man in his late 20s at the scene, on suspicion of terrorist offences. He had been driving alone. The car remains on the scene and is being searched. Police have not found any weapons. Three people were treated at the scene, with two of them taken to hospital. The London Ambulance Service said the injuries are not believed to be serious. The British government will hold an emergency meeting for its Cabinet Office Briefing Rooms committee, also known as COBRA, to discuss the attack at 2 p.m. on Tuesday. 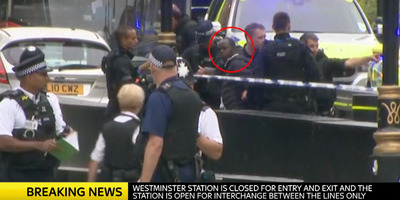 Sky News broadcast footage appearing to show a man being detained after the crash, whom the network circled in red. “I was coming up to Westminster on a Santander bike. On the right-hand side of the road as you come up to Parliament, there was a female cyclist on the floor injured with others surrounding that. “An ambulance turned up and tried to attend to the person. I was going to continue towards Parliament, but was told to get off my bike. “Considering recent events, I wanted to get out of the area. I returned the way I had come and then cycled around the back of Parliament. “There was smoke coming out of the car and there were suspicions there was a device, but that was unconfirmed, I was just told that by another cyclist. Videos tweeted by Sky News and Euronews/NBC UK journalist Vincent McAviney showed heavily armed police at the scene as the man is led from the car in handcuffs. Video of the male driver arrested after a car crashed into security barriers outside Parliament in Westminster. Westminster Station has been closed as police respond to the event. Several streets around nearby Parliament Square and Victoria Tower Gardens have been cordoned off. In 2017, 52-year-old Briton Khalid Masood rammed his car into pedestrians on the pavement along the south side of the Westminster Bridge, injuring more than 50 people and killing five. Masood crashed his car into the fence outside New Palace Yard and fatally stabbed an unarmed police officer before being shot dead. Police stepped up security measures around Westminster after Masood’s attack and another terror attack on London Bridge last year. Extra barriers were put in place, and armed officers were given permission to shoot at moving vehicles involved in attacks,ITV News reported. The Met Police also rolled out new equipment, named the “Talon,” that would place steel spikes on roads to prevent the vehicle-ramming attacks. It’s not clear whether the Talon was used on Tuesday.